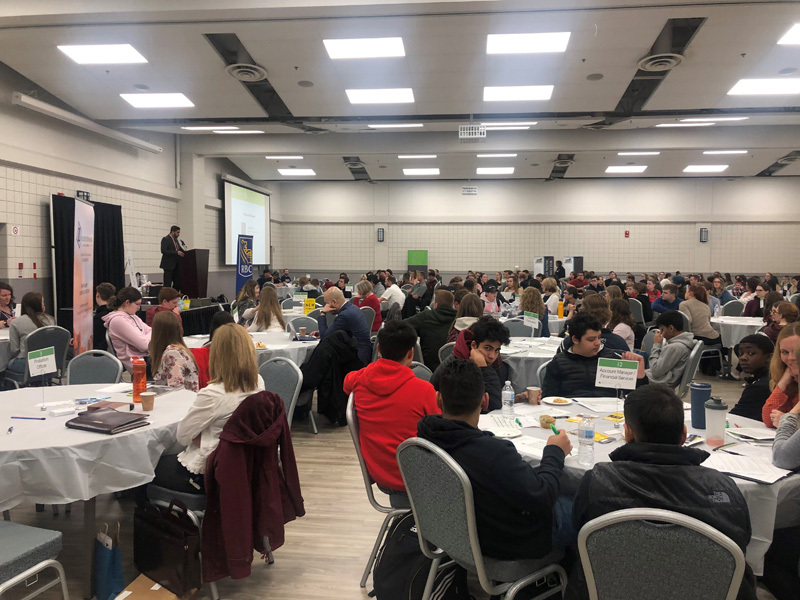 Over 100 Chestermere and Strathmore high school students had an opportunity to learn more about careers they are interested in during the sixth annual JA Southern Alberta World of Choices Career Forum on April 10. “It was amazing, it grew quite a bit from last year. Everybody got a lot out of the event, and I heard a lot of positive remarks from the mentors and students,” said the southeast Prairie Regional Coordinator Lindsay Pollon. “The teachers really do see the value in this event, and encourage their students to participate,” she added. The JA Southern Alberta World of Choices Forum is designed to connect high school students with career mentors in the community to discuss available options, and the steps required to get into the industries they are interested in. By meeting with career mentors, high school students can acquire more in-depth information regarding careers they are interested in. With that information they can better determine if that career would be a good fit for them. They also have the added benefit of gaining new ideas and a new perspective of many different options in career choices. “Graduating high school in itself is quite intimidating, and not knowing what the next step is part of the growing and changing process. It’s so important for students to connect with career mentors in their community who are working in the careers they are interested in,” Pollon said. “Students can find out if their chosen career is something they want to pursue, and lin many cases hear about the day to day frustrations and rewards from someone who knows that position. It’s an incredible part of the event,” Pollon added. Throughout the event, students were encouraged to talk to over 40 career mentors including, a nutritionist, chiropractor, bank representatives, bakery owner, the Strathmore Now team, and Olympic Bronze Medalist Kristi Lay. The students found Lay’s opening address inspiring, when she talked about the up’s and downs, how to learn from mistakes, and the journey she went on to get to the Olympics, Pollon said. “We had a wide range of all different career roles to give the students a good representation of all different career options available to them,” Pollon said. Students were encouraged to step out of their comfort zone and talk to career mentors in industry they may have never considered. “It’s an inspiring event for high school students to see what next steps may be, and see what’s in store for them after school,” Pollon said. “The benefits of the World of Choices Forum will directly extend to the community at large, and will help develop our future business leaders,” she added.